While I was looking at places to visit in London, England, the London Dungeons kept popping up. Willow and I talked about it and this is where I went totally wrong. I did not do my homework at all. 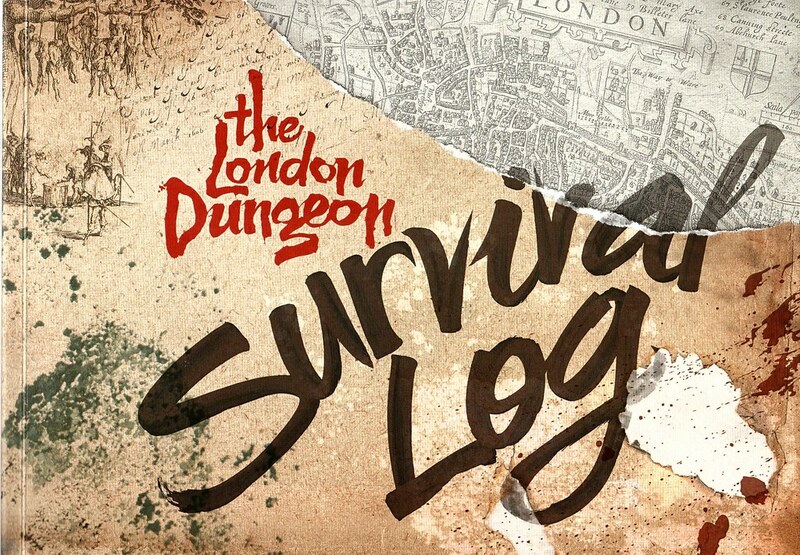 I let what I thought the London Dungeons would be like take over and I didn’t even bother looking them up. Hindsight is a great thing! After a day of wandering, we came across London Dungeons and thought about going in. Wow this looked like a great thing to do in London. At that stage, we had not discovered how much it would cost all of us to go in there and we had overspent on the daily budget by a significant amount on all our days visiting London attractions. And if you read the website regularly you will know Mark is a stickler for his daily budget! She assured me that the kids would have a great time and that they would love all the history that they would learn while inside. I still had that feeling in my tummy that something just wasn’t right about the whole situation. The cost was also weighing heavily on my mind. A young lady came up to us while we were still deciding whether to go in or not and offered us her free ticket. At first with all the scams that go on, I was hesitant to take it from her but she insisted that ‘this sort of thing’ was just ‘not for her’. She genuinely looked frightened and that is probably when I should have said let’s go back to the hotel! We took her ticket and offered her some money for it which she turned down. If you ever read this thank you very much but I should have done what you did and waited out the front! We entered and paid for our other tickets we needed, now we just waited for our entry time. The girls both decided that they needed to go to the toilet so I took them in. As we walked into the toilet you could hear sound effects like creaking doors and a very evil laugh! The girls thought it was a bit creepy and both gave a nervous laugh. As we all got a stall and sat down the scurrying of rats noises started. I actually looked down at my feet and both the girls yelled out ‘mum’ I said it was ok and that’s when IT happened. A very low, male voice says ‘I can seeeeeee you’ followed by another evil giggle! Both the girls and I were pants up and out of our stalls in a flash. We all nervous giggled and washed out hands to go back and meet Mark, all while the sound effects started again! He was still waiting in line for us and we were ushered into a small passageway to then start the tour. Some of the actors came up to the girls and chatted to them, called them cute and made reference to Mark looking nice in a meat pie! I asked again if this was good for us to be in and I was again reassured it would be good BUT I was able to speak to one of the actors at any stage and they would help us out. I don’t want to ruin the format of the tour for anyone who will enjoy having the absolute crap scared out of them for an hour. I have never hung onto Mark as tightly as I did that day. He also had the two girls hanging off him as well while he was trying to enjoy having the crap scared out of him! We were made to let go of him while he was dragged up to be a part of two of the small shows. As he was going off to be a part of it the girls looked like they were both going to have total meltdowns and possibly never see him again! After the first time, they learned that he would come back and he would be ok! I was also singled out at one point which freaked me out. Mark thought it was totally hilarious that the three of us were just babbling messes with every new act that we entered! Now I look back on it and it is quite funny at our reactions and we would have been the prime people to pick out of the audience due to the absolute look of terror on our faces! In honesty, I did learn plenty of history about London in the old days and things that went on in the past. London was not safe in those days. For me, though it was the way it was delivered that frightened me and the girls. Mark really enjoyed the way it was done and would recommend it if you are going to London and that is the kind of thing you like. 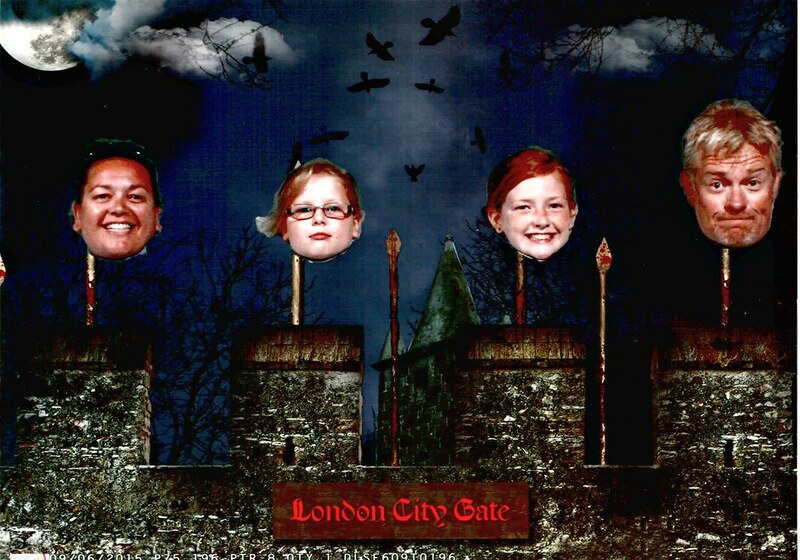 Are the London Dungeon kids appropriate? I would not recommend it if you are scared easily. Even at times, I knew that things were coming I would still be shaking in my boots about it after it had happened! I also don’t think it is appropriate, in my opinion, for children. My girls are both really into learning about history and enjoy most things we do but they both didn’t like this at all. If you also have issues with the dark, strobe lights, jolting rides and genuinely just getting freaked out easily I recommend that you wait out the front of The London Dungeons for your friends! We are between Big Ben and The Coca-Cola London Eye – within the County Hall Building and right next to the London SEA LIFE Aquarium. Just follow signs for the South Bank; we are right next door to the Coca-Cola London Eye and SEA LIFE London Aquarium. It’s all you need for a day out in one place. London is a huge city that is well connected by public transport. Staying in the city centre will be more expensive but maybe more convienient. Staying out further will be cheaper but transport costs into the city will be more expensive. This is an old favourite and has been going for many years. I don’t remember it being particularly scary – just spooky fun! My boys were too little to go last time we were in London. Now that they are older, I think they would love it! Great post – totally not my thing, but I know my teenage boys would love it, and they’ve been very hard to please on our travels lately. I’ll buy their tickets and go have a drink somewhere while I wait for them. I don’t have kids, but this looks like the most awesome thing, even for grown ups. I will definitely go next time I’m in London! I am SUCH a big baby and don’t really like being frightened on purpose but I do love the idea of these dungeons. Such a great way to teach kids about history! I might check out the London ones next time I’m there. Never heard about this place, like never been in London as well 😀 (how come it can be?:D). In any case, I see that it’s place more worth to visit with family, friends than alone? I only vaguely remember our time in the London Dungeons – we got about halfway through though unfortunately a fire alarm went off so we all had to evacuate, and then I just never got back. Haha we were all wondering for a couple of seconds whether or not it was part of the experience, but turned out to be the real thing (false alarm though). I love that it combines fun with education – best way to learn! The interactive side would make learning about London history more interesting for many but I jump so easily I would be a fidgety mess by the end of almost 2 hours. To be honest though I think I’d still do it. I’m not a big fan of scary attractions and I think I would have bolted from the place entirely if I was in the bathroom and a creepy voice said “i can seee yooouuu! !” Freaky – and not in a good way! Hope the girls aren’t scarred for life! This is an awesome way to learn history! fun and non-threatening. We have always seen it and thought about doing the London dungeons when we uses to visit London but I felt the kids were too little and more than that it was so expensive! Think my son would enjoy it now, not sure I will! I’m usually not a fan of horror-related things because I’m super super afraid of anything horror related. But in spite of that fact, I really did enjoy going to the London dungeons! I think that it’s really well made and you actually learn a lot of the history of the city. Definitely recommend it! This is totally the type of tour I would do! I’m up for anything underground, creepy or scary! Oh man! I’d love something like this. Kind of like a haunted walk during Halloween. I like that you learn something about London’s history while you get the crap scared out of you! I could see it being a bit much for kids, though! Sounds like it was more scary than fun. While it sounds educational, I’m not sure the environment would be conducive for me. Glad your husband enjoyed the experience and it seems that it would be right for some people 🙂 Thanks for sharing though! This is definitely an interesting and unique way to learn about London’s history. It probably won’t be my first choice since I’m not really a fan (anymore) of scary attractions. Great find though! I’m sure there’s some people who would totally enjoy this. I shouldn’t laugh but I find this so funny. I’d be exactly like you, I can’t watch Jaws at all and Jurassic Park leaves me jumping out of my skin. Your poor girls. Sorry, I’m still laughing but I feel for you! I’m sorry – but couldn’t help laughing at this. 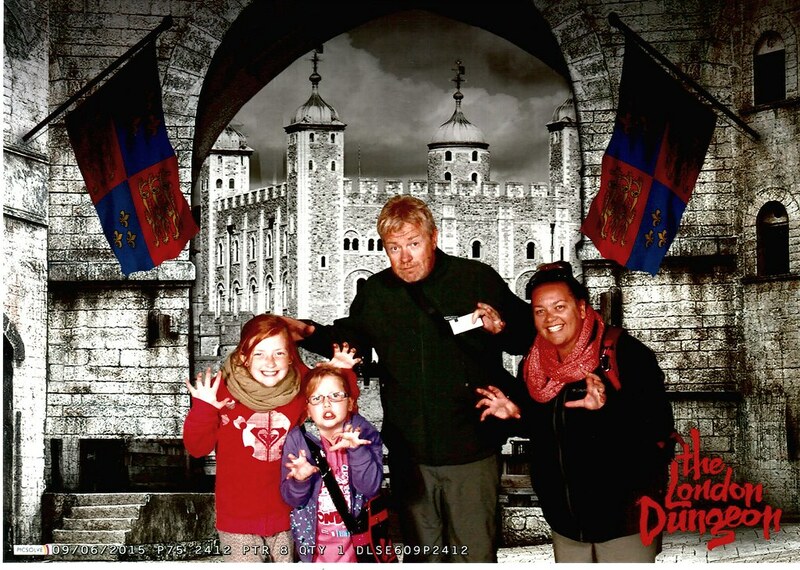 I’ve never really looked into what the London Dungeons are all about either – so thanks for writing this post…will NOT be taking my three year old daughter… and six is definitely still too young… that incident in the toilet – very funny – but would have freaked me out too! Thanks for linking to #citytripping (and making me chuckle). This is definitely a must do next time we are in London!